For more information about this event, please contact Infree Records at info@infreerecords.com. We are proud to invite ANCESTOR / 祖先 - Old school Thrash Metal. 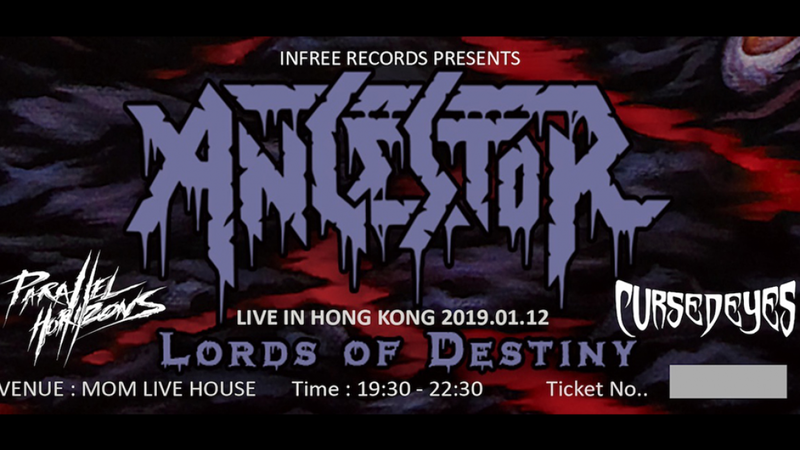 We will be giving away ANCESTORS new full length CD "LORDS OF DESTINY" CD to people who purchase advance ticket before Jan 2nd, 2019. Venue can only fit maximum 200 people !! Thank you for your support to the local metal/rock Hong Kong bands and scene! INFREE RECORDS now has held 4 shows with 23 bands playing in total never overlapping , we hope to keep this going on in 2019. Beijing’s thrash force ANCESTOR is considered to be one of the first Chinese old school Thrash Metal bands. Under the influence KREATOR, PROTECTOR, SODOM and other underground legends of the Teutonic Thrash Metal scene, the four-piece have been making violent underground sound since 2007. Due to unstable line-up in the early days, the lads have only managed to release their debut EP in 2017. The five-tracker under the title Age of Overload is a pure underground killer. It is brutal, energetic and violent while being musical. The darkness and the artistic seriousness of the EP reminds people of the early 80s when the European thrash metal scene began to thrive. But this is happening in Beijing, China, in the 21st Century. ANCESTOR plays up-tempo Thrash Metal. Their music is aggressive in their own way. In spite of their old school song-writing, they have a quite unique production, which makes their music sounds quite neat. After their release of the first album, they have made a big tour in and around China. ANCESTOR has been shared stage with ASSASSIN, ARTILLERY, LEGION OF THE DAMNED, ONSLAUGHT, RAGE, WOLF SPIDER, etc. At the beginning of 2018 ANCESTOR begins to bring out their first full-length album under Awakening Records. This album will be released in autumn of this year. After that, the lads will be on another tour in Asia. Are you ready for the underground thrash maniacs from China? Parallel Horizons is a four piece formed in February 2014 in the heart of Hong Kong, bursting into the scene with a mixture of metalcore, deathcore and technical progressive arrangements. After releasing their first EP, Amalgamate, in early March 2014, the band played with Asian and international giants in various countries, including Heartown Festival in Taiwan and JakCloth Indonesia and a Philippines tour in 2018. The band’s debut album, Dissonant Echoes, was released in October 2017 and received positive reviews, with South China Morning Post listing it as one of the Top 10 indie releases in Hong Kong. Formed in 2012 with melodic death metal style named "Cursed Phoenix". After line up changes, the debut public performance was started with the new name "Cursed Eyes". We have been touring around including Taiwan, Beijing, Canton area and even Nepal. We will keep striving to provide something new and adventurous stuff to audience.